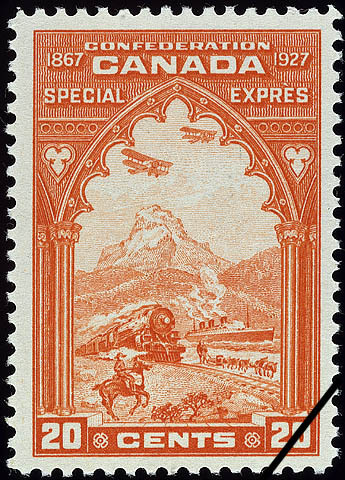 In conjunction with the Confederation Commemorative Issue of 1927, the Post Office Department issued a Commemorative Special Delivery stamp of particular interest. Five stages of mail transportation in Canada, from a drawing by a staff artist of the Canadian Bank Note Company Limited. Through a Gothic arcade, five different methods of mail transportation are shown: a nounted mail courier, a dog-train, an express train, an ocean liner and two biplanes. These appear against a background revealing something of Canada's vastness, beauty and diversity. The mountain peak is a free rendering of Mount Cathedral, in Yoho National Park, Alberta. The stretch of land in the foreground suggests the Canadian prairies with the snow typifying the northern areas. The water is the great St. Lawrence waterway, and the train represents Canada's extensive transcontinental railway systems. The words "Canada P.O." appear finely engraved across the mail bag carried by the horse in the foreground. Patrick, Douglas and Mary Patrick. Canada's Postage Stamps. Toronto, McClelland and Stewart Limited, 1964, p. 181.